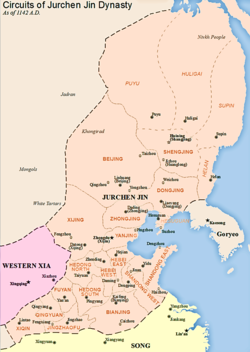 The Jin dynasty, offeecially kent as the Great Jin, lastit frae 1115 tae 1234 as ane o the last dynasties in Cheenese history tae predate the Mongol invasion o Cheenae. ↑ Turchin, Peter; Adams, Jonathan M.; Hall, Thomas D (December 2006). "East-West Orientation of Historical Empires" (PDF). Journal of world-systems research. 12 (2): 219–229. ISSN 1076-156X. Archived frae the oreeginal (PDF) on 22 February 2007. Retrieved 12 August 2010. This page wis last eeditit on 23 Dizember 2017, at 02:08.